Replacing even a single missing tooth is essential to ensure you maintain the optimal level of oral health and avoid further tooth loss. For those patients who have lost numerous teeth, smile restoration is even more essential. Not only does it ensure you look and feel better, it also restores your ability to eat a more varied diet. 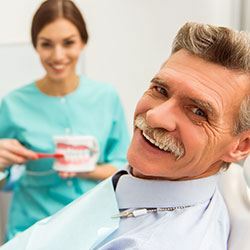 For many patients who experience extensive tooth loss, traditional, removable partial and full dentures have been the go to tooth replacement solution for decades. Today, many patients are able to achieve longer lasting results with improved stability using an implant supported denture. Unfortunately, some patients have experienced severely diminished jawbone density and gum tissue volume that makes implant supported denture placement impossible. The innovative All-on-4 denture may be a viable alternative for many patients. If you’re interested in learning more about All-on-4 implant supported dentures, call Region Dental to schedule a tooth replacement consultation with us in our La Porte dentistry practice. All-on-4 is an innovative implant supported denture technique. Traditional implant-retained dentures use four to six implant posts strategically positioned along the gum line to support the denture. Patients who have experienced advanced tooth loss often struggle with diminished jawbone density and gum tissue volume that reduces chances for successful implant placement, and they need tissue grafts to restore bone density and soft tissue volume before success implant placement. The All-on-4 method allows us to utilize the naturally denser portion of the jaw to provide successful implant placement without the need for tissue grafts. Like other implant supported tooth replacement plans, the All-on-4 process is completed in two treatment phases – surgical placement and restoration. To complete the innovative All-on-4 implant placement, we use the naturally denser portion of the jaw at the front of the mouth. Two implants are placed vertically to support the front of the denture. Then, two implants are inserted diagonally from the back of the denture to the front of the jaw. 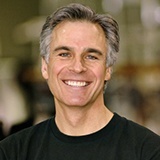 We typically attach a light-weight temporary denture on the same day your implants are placed. Once the implants have fully fused with the jawbone, you’ll return to exchange your temporary denture for the final prosthetic. 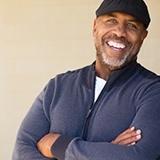 Improved success – for patients who have experienced diminished jawbone density or gum tissue volume, the innovative All-on-4 implant placement method improves the chances for successful implant placement. Immediate load dentures – in many cases, we can attach a temporary denture on the same day we place your All-on-4 implants. That means you don’t have to spend even one more day without a whole, healthy smile. Improved stability – compared with traditional, removable dentures that only restore about 20% of chewing ability, All-on-4 implant dentures repair about 70% of the natural chewing ability. This allows you to eat a wider array of foods and speak and smile with confidence. Improved comfort – traditional dentures can slip and slide, and they place pressure on soft tissue. All-on-4 dentures remain firmly in place for improved comfort. Longer lasting – most patients can keep their All-on-4 dentures for two or more decades. In fact, the majority of patients maintain the same implant retained prosthetic for their entire lifetime.